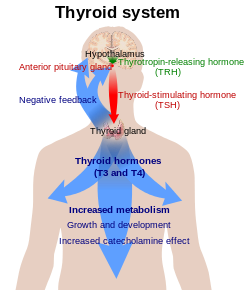 TSH (with a half life of about an hour) stimulates the thyroid gland to secrete the hormone thyroxine (T4), which has only a slight effect on metabolism. T4 is converted to triiodothyronine (T3), which is the active hormone that stimulates metabolism. About 80% of this conversion is in the liver and other organs, and 20% in the thyroid itself. TSH is secreted throughout life but particularly reaches high levels during the periods of rapid growth and development, as well as in response to stress. The hypothalamus, in the base of the brain, produces thyrotropin-releasing hormone (TRH). TRH stimulates the anterior pituitary gland to produce TSH. Somatostatin is also produced by the hypothalamus, and has an opposite effect on the pituitary production of TSH, decreasing or inhibiting its release. The concentration of thyroid hormones (T3 and T4) in the blood regulates the pituitary release of TSH; when T3 and T4 concentrations are low, the production of TSH is increased, and, conversely, when T3 and T4 concentrations are high, TSH production is decreased. This is an example of a negative feedback loop. Any inappropriateness of measured values, for instance a low-normal TSH together with a low-normal T4 may signal tertiary (central) disease and a TSH to TRH pathology. Elevated reverse T3 (RT3) together with low-normal TSH and low-normal T3, T4 values, which is regarded as indicative for euthyroid sick syndrome, may also have to be investigated for chronic subacute thyroiditis (SAT) with output of subpotent hormones. Absence of antibodies in patients with diagnoses of an autoimmune thyroid in their past would always be suspicious for development to SAT even in the presence of a normal TSH because there is no known recovery from autoimmunity. For clinical interpretation of laboratory results it is important to acknowledge that TSH is released in a pulsatile manner resulting in both circadian and ultradian rhythms of its serum concentrations. TSH is a glycoprotein and consists of two subunits, the alpha and the beta subunit. The α (alpha) subunit (i.e., chorionic gonadotropin alpha) is nearly identical to that of human chorionic gonadotropin (hCG), luteinizing hormone (LH), and follicle-stimulating hormone (FSH). The α subunit is thought to be the effector region responsible for stimulation of adenylate cyclase (involved the generation of cAMP). The α chain has a 92-amino acid sequence. The β (beta) subunit (TSHB) is unique to TSH, and therefore determines its receptor specificity. The β chain has a 118-amino acid sequence. The TSH receptor is found mainly on thyroid follicular cells. Stimulation of the receptor increases T3 and T4 production and secretion. This occurs through stimulation of six steps in thyroid hormone synthesis: (1) Up-regulating the activity of the sodium-iodide symporter (NIS) on the basolateral membrane of follicular cells, thereby increasing intracellular concentrations of iodine (iodine trapping). (2) Stimulating iodination of thyroglobulin in the follicular lumen, a precursor protein of thyroid hormone. (3) Stimulating the conjugation of iodinated tyrosine residues. This leads to the formation of thyroxine (T4) and triiodothyronine (T3) that remain attached to the thyroglobulin protein. (4) Increased endocytocis of the iodinated thyroglobulin protein across the apical membrane back into the follicular cell. (5) Stimulation of proteolysis of iodinated thyroglobulin to form free thyroxine (T4) and triiodothyronine (T3). (6) Secretion of thyroxine (T4) and triiodothyronine (T3) across the basolateral membrane of follicular cells to enter the circulation. This occurs by an unknown mechanism. Stimulating antibodies to the TSH receptor mimic TSH and cause Graves' disease. In addition, hCG shows some cross-reactivity to the TSH receptor and therefore can stimulate production of thyroid hormones. In pregnancy, prolonged high concentrations of hCG can produce a transient condition termed gestational hyperthyroidism. This is also the mechanism of trophoblastic tumors increasing the production of thyroid hormones. Reference ranges for TSH may vary slightly, depending on the method of analysis, and do not necessarily equate to cut-offs for diagnosing thyroid dysfunction. In the UK, guidelines issued by the Association for Clinical Biochemistry suggest a reference range of 0.4-4.0 mIU/mL. The National Academy of Clinical Biochemistry (NACB) stated that it expected the reference range for adults to be reduced to 0.4–2.5 µIU/mL, because research had shown that adults with an initially measured TSH level of over 2.0 µIU/mL had "an increased odds ratio of developing hypothyroidism over the [following] 20 years, especially if thyroid antibodies were elevated". TSH concentrations are measured as part of a thyroid function test in patients suspected of having an excess (hyperthyroidism) or deficiency (hypothyroidism) of thyroid hormones. Interpretation of the results depends on both the TSH and T4 concentrations. In some situations measurement of T3 may also be useful. A TSH assay is now also the recommended screening tool for thyroid disease. Recent advances in increasing the sensitivity of the TSH assay make it a better screening tool than free T4. The therapeutic target range TSH level for patients on treatment ranges between 0.3 and 3.0 μIU/mL. For hypothyroid patients on thyroxine, measurement of TSH alone is generally considered sufficient. An increase in TSH above the normal range indicates under-replacement or poor compliance with therapy. A significant reduction in TSH suggests over-treatment. In both cases, a change in dose may be required. A low or low-normal TSH value may also signal pituitary disease in the absence of replacement. For hyperthyroid patients, both TSH and T4 are usually monitored. It must also be noted that in pregnancy, TSH measurements do not seem to be a good marker for the well-known association of maternal thyroid hormone availability with offspring neurocognitive development. TSH distribution progressively shifts toward higher concentrations with age. Heterophile antibodies (which include human anti-mouse antibodies (HAMA) and Rheumatoid Factor (RF)), which bind weakly to the test assay's animal antibodies, causing a higher (or less commonly lower) TSH result than the actual true TSH level. Although the standard lab assay panels are designed to remove moderate levels of heterophilic antibodies, these fail to remove higher antibody levels. "Dr. Baumann [from Mayo Clinic] and her colleagues found that 4.4 percent of the hundreds of samples she tested were affected by heterophile antibodies.........The hallmark of this condition is a discrepancy between TSH value and free T4 value, and most important between laboratory values and patient's conditions. Endocrinologists, in particular, should be on alert for this." Macro-TSH - endogenous antibodies bind to TSH reducing its activity, so the pituitary gland would need to produce more TSH to obtain the same overall level of TSH activity. TSH Isomers - natural variations of the TSH molecule, which have lower activity, so the pituitary gland would need to produce more TSH to obtain the same overall level of TSH activity. A synthetic drug called recombinant human TSH alpha (rhTSHα or simply rhTSH) or thyrotropin alfa (INN) is manufactured by Genzyme Corp under the trade name Thyrogen. It is used to manipulate endocrine function of thyroid-derived cells, as part of the diagnosis and treatment of thyroid cancer. ^ a b Merck Manual of Diagnosis and Therapy, Thyroid gland disorders. ^ a b Sacher R, Richard A. McPherson (2000). Widmann's Clinical Interpretation of Laboratory Tests, 11th ed. F.A. Davis Company. ISBN 0-8036-0270-7. ^ Magner J (June 2014). "Historical note: many steps led to the 'discovery' of thyroid-stimulating hormone". European Thyroid Journal. 3 (2): 95–100. doi:10.1159/000360534. PMC 4109514. PMID 25114872. ^ Estrada JM, Soldin D, Buckey TM, Burman KD, Soldin OP (Mar 2014). "Thyrotropin isoforms: implications for thyrotropin analysis and clinical practice". Thyroid. 24 (3): 411–23. doi:10.1089/thy.2013.0119. PMC 3949435. PMID 24073798. ^ Greenspan SL, Klibanski A, Schoenfeld D, Ridgway EC (Sep 1986). "Pulsatile secretion of thyrotropin in man". The Journal of Clinical Endocrinology and Metabolism. 63 (3): 661–8. doi:10.1210/jcem-63-3-661. PMID 3734036. ^ Brabant G, Prank K, Ranft U, Schuermeyer T, Wagner TO, Hauser H, Kummer B, Feistner H, Hesch RD, von zur Mühlen A (Feb 1990). "Physiological regulation of circadian and pulsatile thyrotropin secretion in normal man and woman". The Journal of Clinical Endocrinology and Metabolism. 70 (2): 403–9. doi:10.1210/jcem-70-2-403. PMID 2105332. ^ Samuels MH, Veldhuis JD, Henry P, Ridgway EC (Aug 1990). "Pathophysiology of pulsatile and copulsatile release of thyroid-stimulating hormone, luteinizing hormone, follicle-stimulating hormone, and alpha-subunit". The Journal of Clinical Endocrinology and Metabolism. 71 (2): 425–32. doi:10.1210/jcem-71-2-425. PMID 1696277. ^ Hoermann R, Midgley JE, Larisch R, Dietrich JW (20 November 2015). "Homeostatic Control of the Thyroid-Pituitary Axis: Perspectives for Diagnosis and Treatment". Frontiers in Endocrinology. 6: 177. doi:10.3389/fendo.2015.00177. PMC 4653296. PMID 26635726. ^ Lalli E, Sassone-Corsi P (Oct 1995). "Thyroid-stimulating hormone (TSH)-directed induction of the CREM gene in the thyroid gland participates in the long-term desensitization of the TSH receptor" (PDF). Proceedings of the National Academy of Sciences of the United States of America. 92 (21): 9633–7. doi:10.1073/pnas.92.21.9633. PMC 40856. PMID 7568187. ^ Porcellini A, Messina S, De Gregorio G, Feliciello A, Carlucci A, Barone M, Picascia A, De Blasi A, Avvedimento EV (Oct 2003). "The expression of the thyroid-stimulating hormone (TSH) receptor and the cAMP-dependent protein kinase RII beta regulatory subunit confers TSH-cAMP-dependent growth to mouse fibroblasts". The Journal of Biological Chemistry. 278 (42): 40621–30. doi:10.1074/jbc.M307501200. PMID 12902333. ^ Parmentier M, Libert F, Maenhaut C, Lefort A, Gérard C, Perret J, Van Sande J, Dumont JE, Vassart G (Dec 1989). "Molecular cloning of the thyrotropin receptor". Science. 246 (4937): 1620–2. doi:10.1126/science.2556796. PMID 2556796. ^ Boron W, Boulpaed E (2012). Medical Physiology (2nd ed.). Philadelphia: Elsevier Saunders. p. 1046. ISBN 978-1-4377-1753-2. ^ Fantz CR, Dagogo-Jack S, Ladenson JH, Gronowski AM (Dec 1999). "Thyroid function during pregnancy". Clinical Chemistry. 45 (12): 2250–8. PMID 10585360. ^ Use of thyroid function tests: guidelines development group (2008-06-01). "UK Guidelines for the Use of Thyroid Function Tests" (Web Page). Retrieved 2018-04-30. ^ Baloch Z, Carayon P, Conte-Devolx B, Demers LM, Feldt-Rasmussen U, Henry JF, LiVosli VA, Niccoli-Sire P, John R, Ruf J, Smyth PP, Spencer CA, Stockigt JR (Jan 2003). "Laboratory medicine practice guidelines. Laboratory support for the diagnosis and monitoring of thyroid disease". Thyroid. 13 (1): 3–126. doi:10.1089/105072503321086962. PMID 12625976. ^ Baskin HJ, Cobin RH, Duick DS, Gharib H, Guttler RB, Kaplan MM, Segal RL (2002). "American Association of Clinical Endocrinologists medical guidelines for clinical practice for the evaluation and treatment of hyperthyroidism and hypothyroidism" (PDF). Endocrine Practice. 8 (6): 457–69. PMID 15260011. ^ Baskin; et al. (2002). "AACE Medical Guidelines for Clinical Practice for Evaluation and Treatment of Hyperthyroidism and Hypothyroidism" (PDF). American Association of Clinical Endocrinologists. pp. 462, 465. ^ Korevaar TI, Muetzel R, Medici M, Chaker L, Jaddoe VW, de Rijke YB, Steegers EA, Visser TJ, White T, Tiemeier H, Peeters RP (Oct 2015). "Association of maternal thyroid function during early pregnancy with offspring IQ and brain morphology in childhood: a population-based prospective cohort study". The Lancet Diabetes & Endocrinology. 4: 35–43. doi:10.1016/S2213-8587(15)00327-7. PMID 26497402. ^ Surks MI, Hollowell JG (2007). "Age-specific distribution of serum thyrotropin and antithyroid antibodies in the US population: implications for the prevalence of subclinical hypothyroidism". The Journal of Clinical Endocrinology and Metabolism. 92 (12): 4575–82. doi:10.1210/jc.2007-1499. PMID 17911171. ^ Morton A (June 2014). "When lab tests lie ... heterophile antibodies". Australian Family Physician. 43 (6): 391–393. PMID 24897990. ^ Garcia-Gonzaleza E, Aramendia M, Alvarez-Ballano D, Trincado P, Rello L (April 2016). "Serum sample containing endogenous antibodies interfering with multiple hormone immunoassays. Laboratory strategies to detect interference". Practical Laboratory Medicine. 4 (1): 1–10. doi:10.1016/j.plabm.2015.11.001. ^ Hattori N, Ishihara T, Shimatsu A (Jan 2016). "Variability in the detection of macro TSH in different immunoassay systems". European Journal of Endocrinology. 174 (1): 9–15. doi:10.1530/EJE-15-0883. PMID 26438715. ^ Beck-Peccoz P, Persani L (Oct 1994). "Variable biological activity of thyroid-stimulating hormone". European Journal of Endocrinology. 131 (4): 331–40. doi:10.1530/eje.0.1310331. PMID 7921220. ^ Sergi I, Papandreou MJ, Medri G, Canonne C, Verrier B, Ronin C (Jun 1991). "Immunoreactive and bioactive isoforms of human thyrotropin". Endocrinology. 128 (6): 3259–68. doi:10.1210/endo-128-6-3259. PMID 2036989. ^ Duntas LH, Tsakalakos N, Grab-Duntas B, Kalarritou M, Papadodima E (2003). "The use of recombinant human thyrotropin (Thyrogen) in the diagnosis and treatment of thyroid cancer". Hormones. 2 (3): 169–74. doi:10.14310/horm.2002.1197. PMID 17003018.